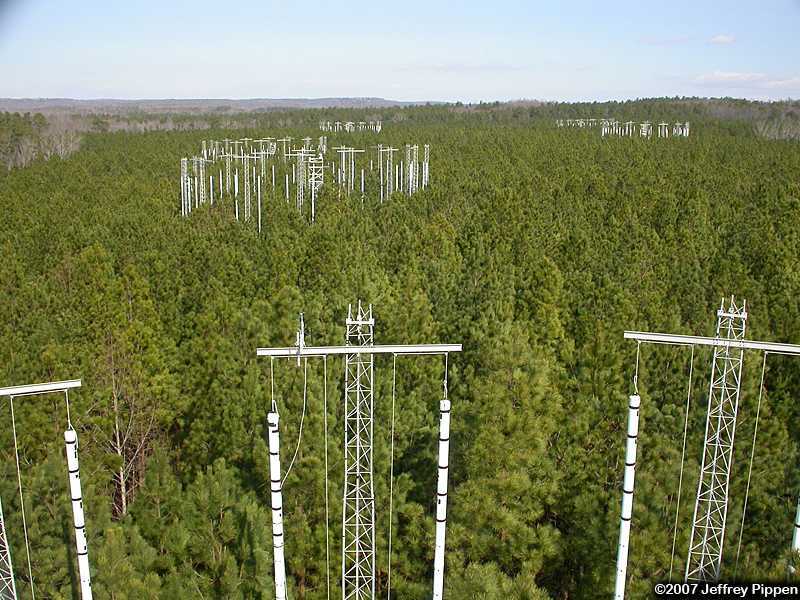 Here is the Duke FACE site, where we are enriching the air inside 4 plots of trees in a pine plantation in the Duke Forest with an additional 200ppm CO2 (carbon dioxide) over ambient levels in order to evaluate how pine forests of the future will grow. An additional 4 fully instrumented plots of trees are used as "control" plots, where we study forest growth without additional CO2 for comparison. We also have 4 non-instrumented ambient plots where we follow basic carbon and nitrogen cycling and tree growth. 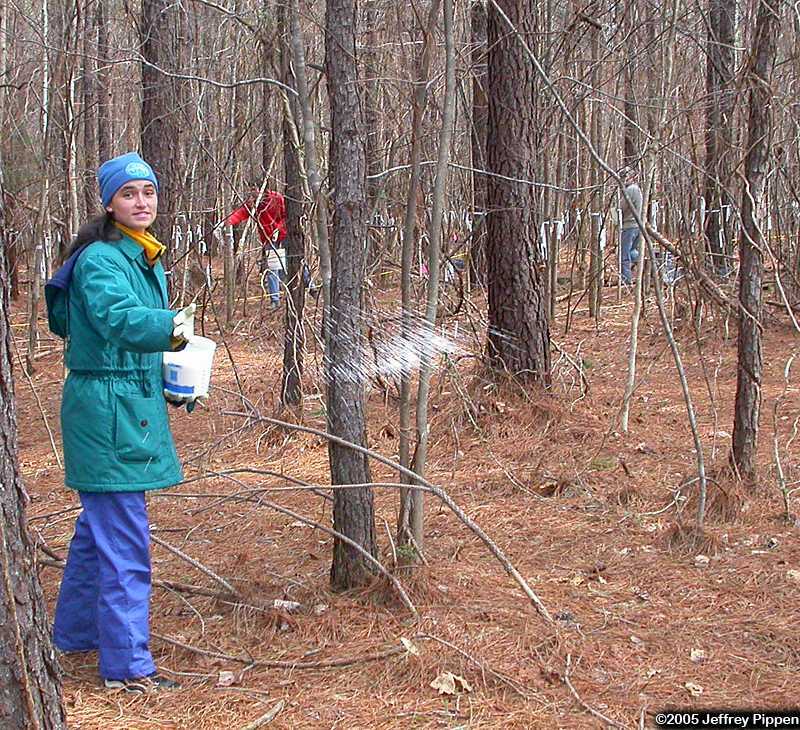 In total, I work in 12 forested plots studying/measuring nearly 3000 individual trees. 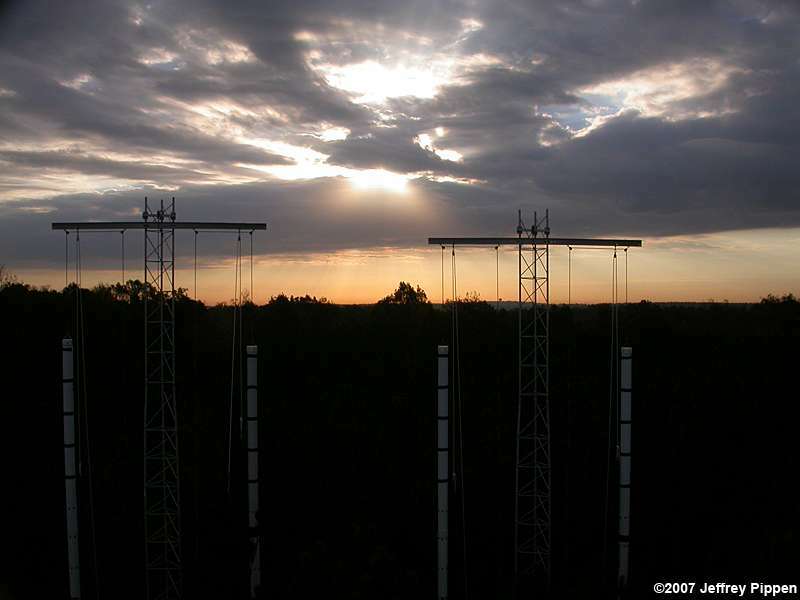 Scientists predict that global atmospheric CO2 levels will reach between 500 and 600ppm in the next 40 years or so. Since trees absorb CO2 during photosynthesis and use it to make carbohydrates for food and structural components (growth), then higher levels of CO2 will affect forest growth. We're studying how it will affect forest growth, and whether forests like this can help offset the global rise in atmospheric CO2. My research focusses primarily on above-ground tree growth and below-ground carbon dynamics. 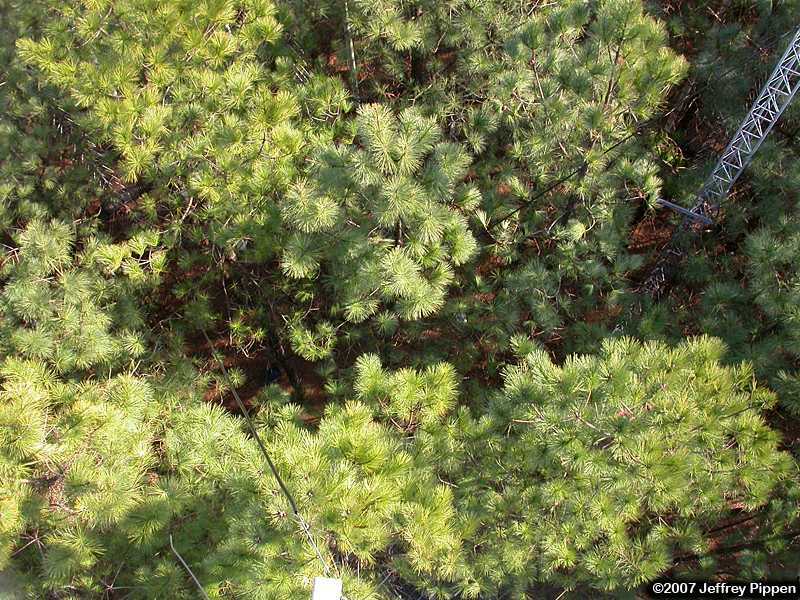 Here's a view of the study plots from above the forest canopy. Each plot is 30m (~100 feet) in diameter and is surrounded by 32 vent pipes which supply the extra CO2 (in the enriched plots) or ambient air (in the control plots). 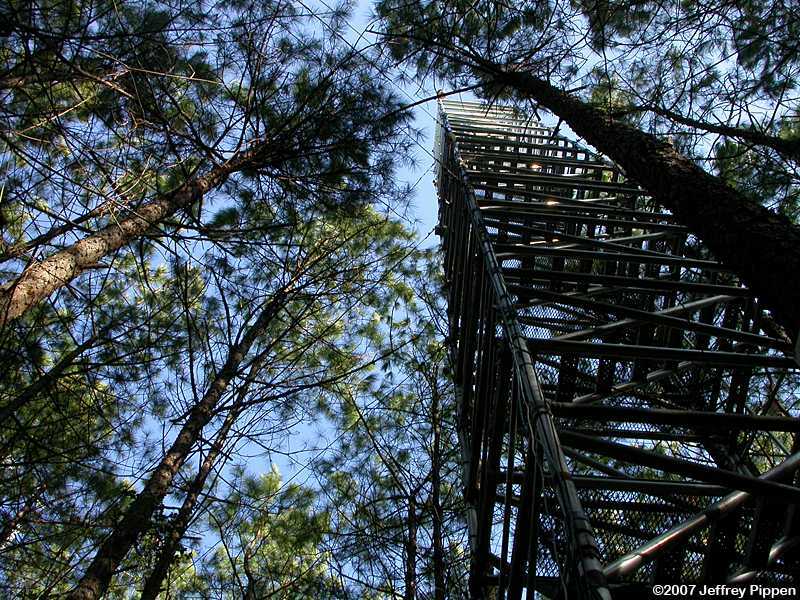 This is a view a single FACE plot (ring 6) with the superstructure towering above the 70 feet tall trees. 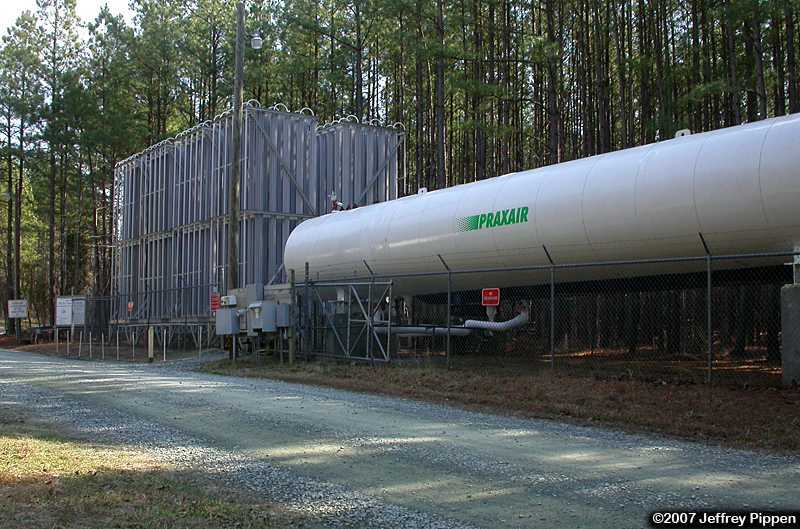 These tanks provide our CO2 supply, which is delivered in very cold, high-pressure liquid form by tanker trucks. The CO2 then passes through the large series of fins next to the tanks in order to warm it up enough to turn it into gas, which is then piped to the research plots. 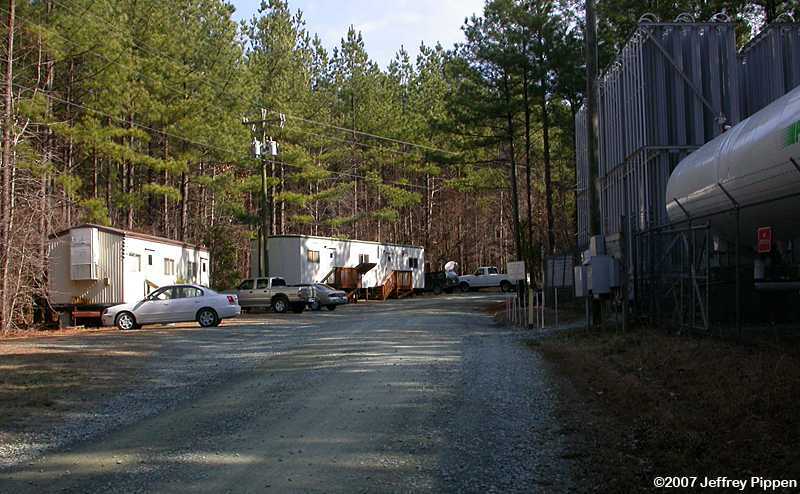 Two trailers provide research and office space. 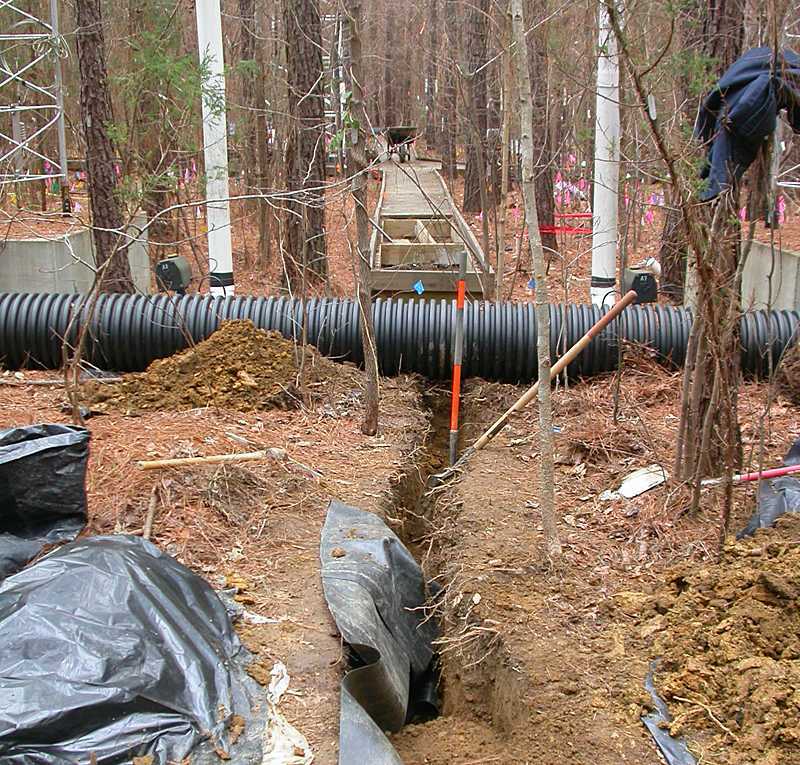 While the research is carried out by scores of professors, post-docs, graduate students, and technicians from many different universities, the maintenance and operation of the facility is carried out by two full-time engineers employed by Brookhaven National Lab. The CO2 is piped from the tanks into sheds outside each plot. 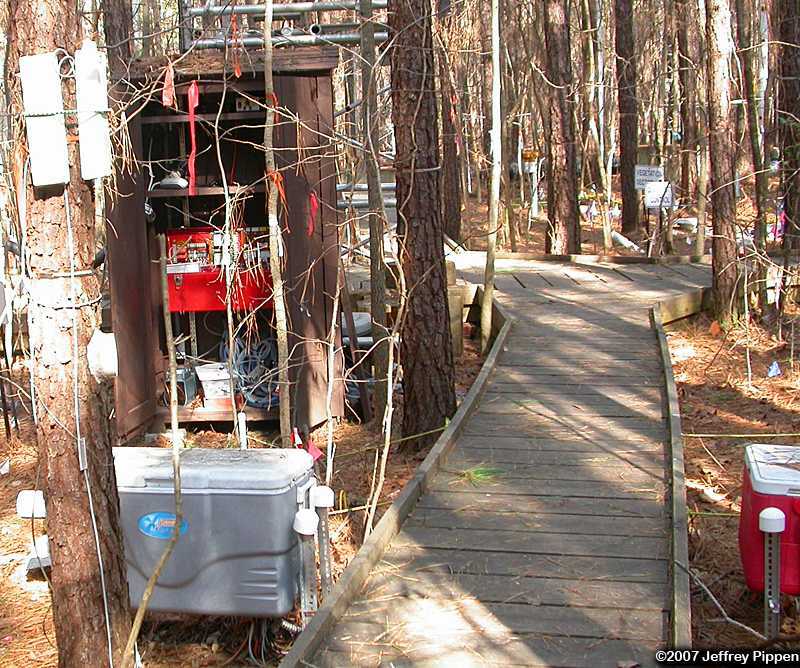 Inside the shed, a computer-controlled valve determines the proper amount of carbon dioxide needed to encrich the plot to a level of 200ppm over ambient levels. The high CO2-ambient air mix is blown into the large, black corrugated pipe on the ground that surrounds the entire plot. Based on wind direction, computer-controlled on/off valves regulate which eight of the 32 vertical vent pipes are turned on at any given moment. 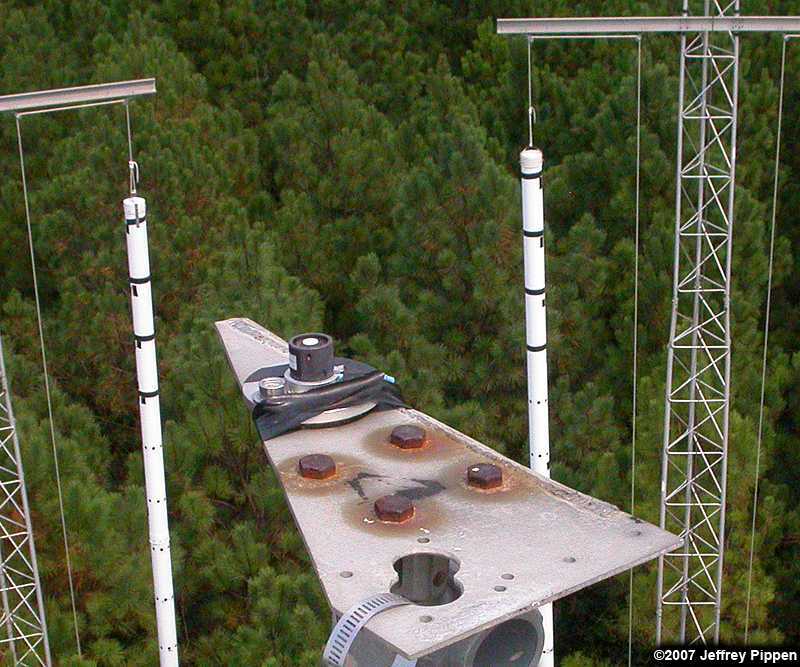 The vent pipes blow CO2 from ground level to above the canopy and are held up by support towers. 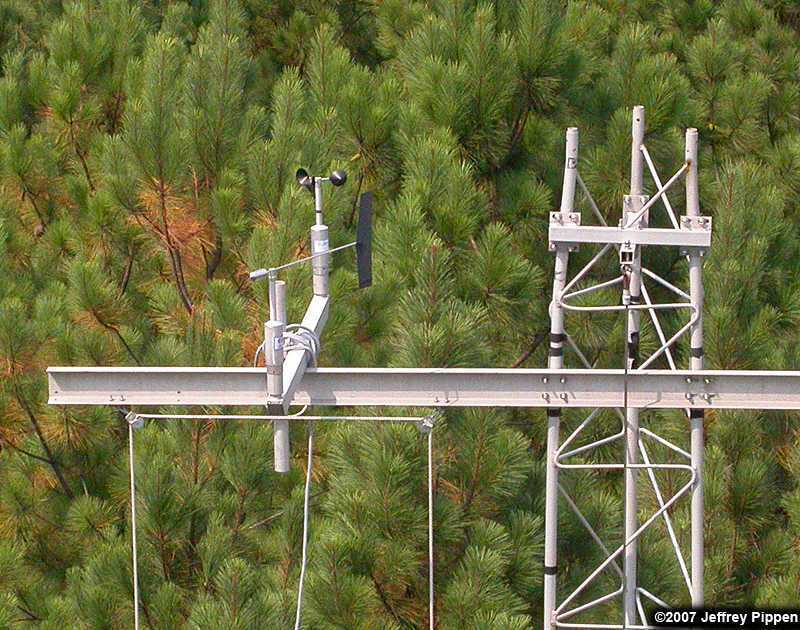 Wind speed and direction are measured by sensors mounted atop a peripheral support tower. Mounted on top of the central walk-up towers are various environmental sensors like this PAR sensor, which measures incoming solar Photosynthetically Active Radiation. Data measured by the sensor is automatically and continuously recorded by dataloggers at the bottom of each central tower. Vaisala HMP sensors measuring temperature and relative humidity are mounted to the central tower at the middle heights of the pine canopy and the hardwood canopy. A boardwalk in each plot allows convenient access to the trees and to research equipment in the plot interior and prevents excess soil compaction. 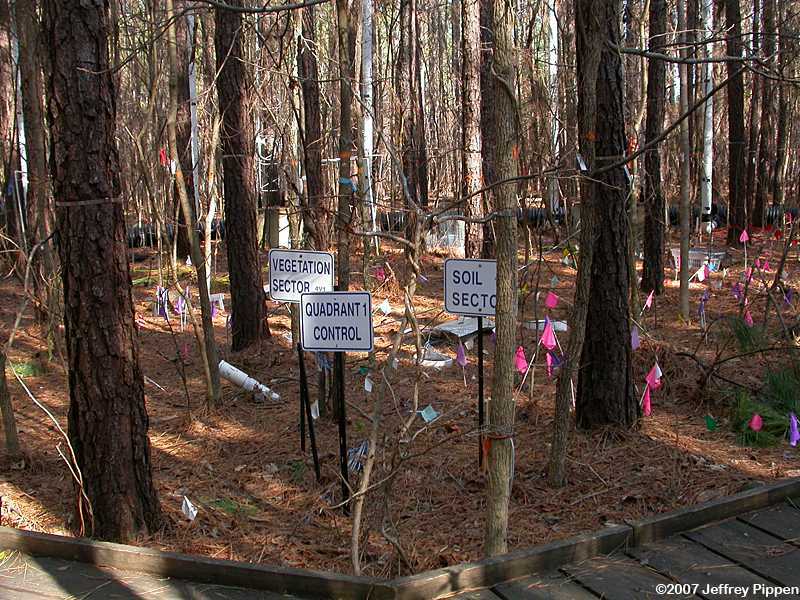 The boardwalk divides the plot into quadrants, and each quadrant is divided into a soil sector for below-ground studies, and a vegetation sector for above-ground studies. 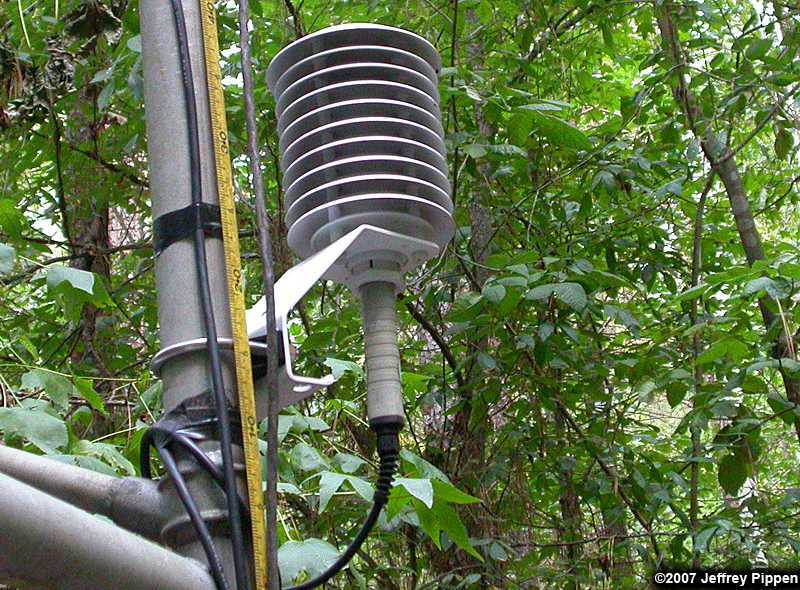 Sensors measure and automatically record rainfall, soil moisture, soil temperature, air temperature, relative humidity, solar radiation, soil CO2 emission, etc. 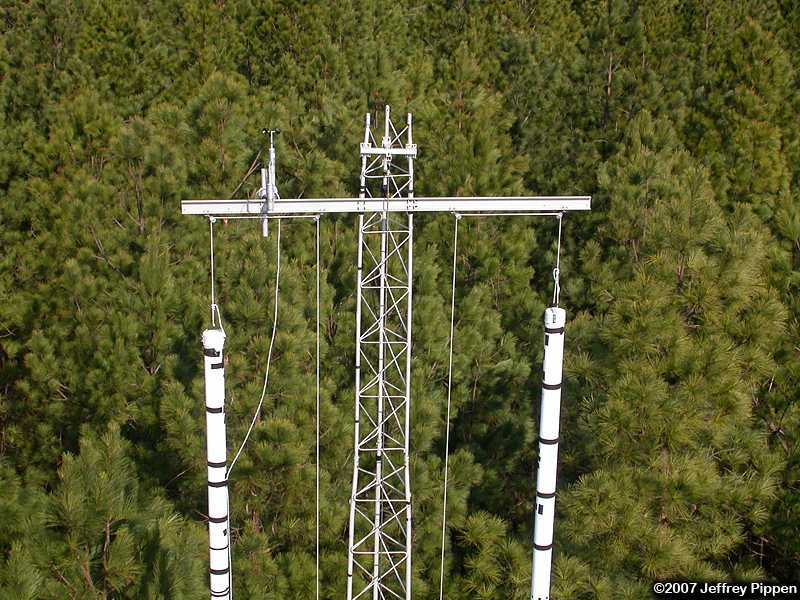 Additionally, each tree is fitted with a dendrometer band which measures tree growth in hundredths of an inch. I have nearly a thousand trees fitted with these bands and we read them every two weeks! 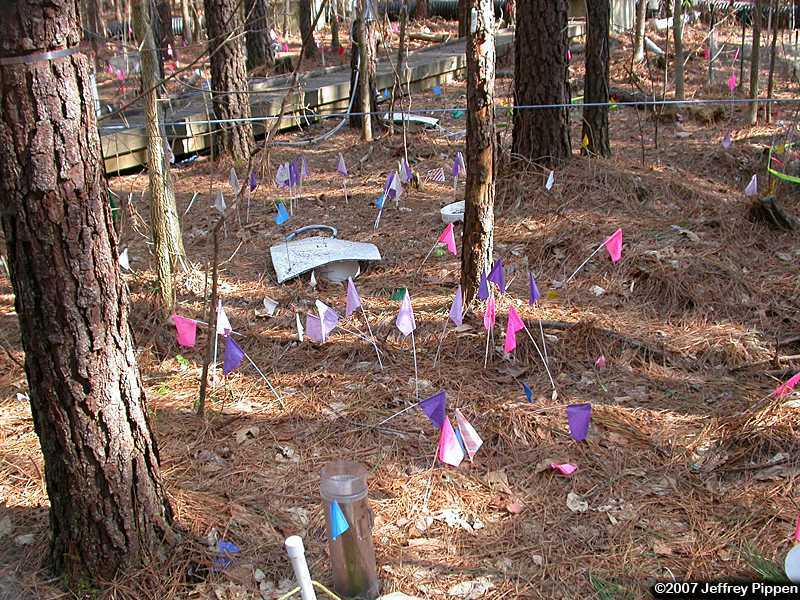 Pin flags indicate where soil samples have been taken for analysis of nutrients like Carbon & Nitrogen, as well as root biomass. 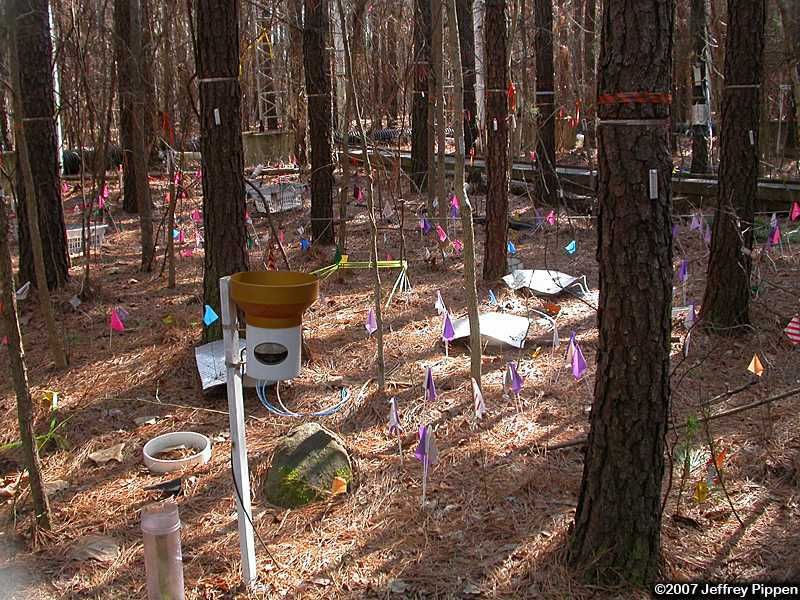 Other flags indicate location of equipment or understory plants that are measured. 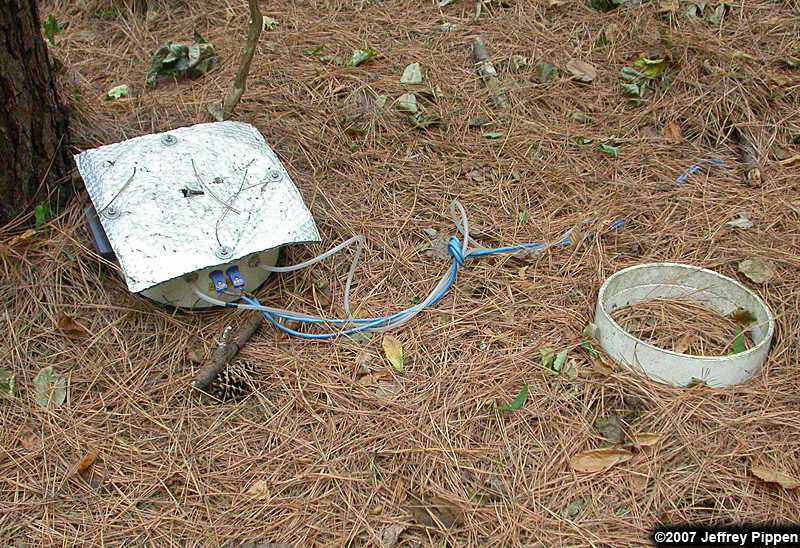 CO2 efflux from the soil into the atmosphere is measured continuously as part of the ACES (Automated Carbon Efflux System) project. Chamber positions are alternated twice a week to prevent single locations from being deprived of rainfall and canopy litterfall inputs. In the early spring of 2005, each FACE ring was split in half and a rubberized root barrier was installed to allow nitrogen fertilization of half of each FACE ring. Clarissa helps spread fertilizer. Pellet ammonium nitrate fertilizer is hand broadcast over half of each plot in the early spring before each growing season. Each plot has a central walk-up tower for accessing the canopy. Here's the view from the top of the tower looking straight down, about 25 meters (over 80 feet). Every few years we get enough snowfall to last a couple of days! Sunrise over ring 4 at the Duke FACE site. Click here for links to pictures of people and specific research projects at the Duke FACE site. Legrand, HE, KE Camburn, S Cooper, RJ Davis, EV Dean, WK Forsythe, JS Pippen, MH Tove, RL Tyndall. 2012. 2011 Annual Report of the North Carolina Bird Records Committee. The Chat 76(1): 1-6. Drake, JE, EH DeLucia, A Gallet-Budynek, KS Hofmockel, ES Bernhardt, SA Billings, RD Jackson, K Johnsen, J Lichter, H McCarthy, ML McCormack, DJP Moore, R Oren, S Palmroth, R Phillips, JS Pippen, SG Pritchard, KK Treseder, W Schlesinger, E Delucia, and AC Finzi. 2011. 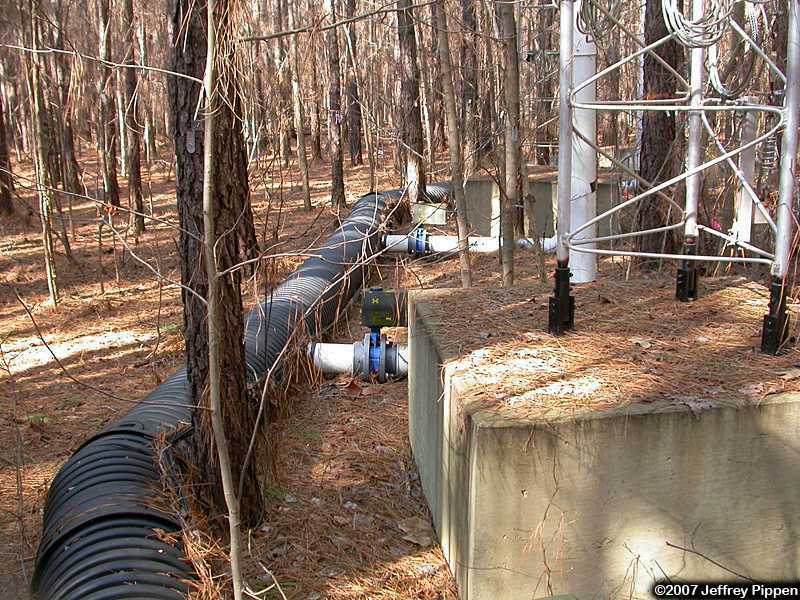 Increases in the Flux of Carbon Belowground Stimulate Nitrogen Uptake and Sustain the Long-Term Enhancement of Forest Productivity Under Elevated CO2. Ecology Letters 14(4) 349-357. Legrand, HE, KE Camburn, S Cooper, RJ Davis, EV Dean, WK Forsythe, JS Pippen, MH Tove, RL Tyndall. 2011. 2010 Annual Report of the North Carolina Bird Records Committee. The Chat 75(1): 1-5. Legrand, H.E., K.E. Camburn, S. Cooper, R.J. Davis, E.V. Dean, W.K. Forsythe, J.S. Pippen, M.H. Tove, R.L. Tyndall. 2010. 2009 Annual Report of the North Carolina Bird Records Committee. The Chat 74(1):1-5. 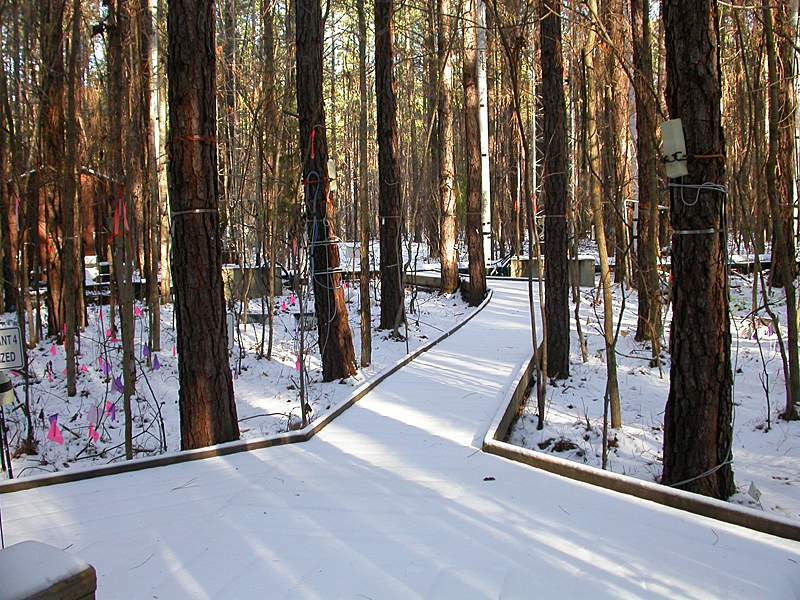 David J.P. Moore, Miquel Gonzalez-Meler, Lina Taneva, Jeffrey S. Pippen, Hyun-Seok Kim, DeLucia, Evan H. The effect of long term CO2 enrichment on apparent stem respiration from Pinus taeda L. is confounded by high levels of soil CO2. Oecologia 158:1-10. Moore, D.J.P., S. Aref, R.M. Ho, J.S. Pippen, J.G. Hamilton, and E.H. DeLucia. 2006. Inter-annual variation in the response of Pinus taeda tree growth to long term Free Air Carbon dioxide Enrichment (FACE). Global Change Biology 12:1367-1377. Schlesinger, W.H., E.H. DeLucia, AC. Finzi, G.R. Hendrey, K.S. Hofmockel, J. Lichter, R. Matamala, D. Moore, R. Oren. J.S. Pippen and R.B. Thomas. 2006. 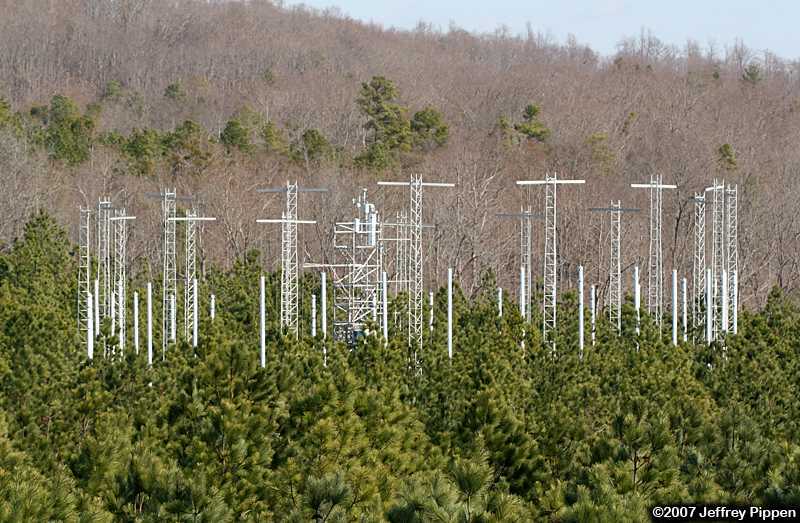 The CO2 response of a temperate coniferous woodland: The Duke Forest FACE experiment. In: Managed Ecosystems and CO2: Case Studies, Processes, and Perspectives. J. Nösberger, S.P.Long, R.J.Norby, M. Stitt, G.R. Hendrey and H. Blum, editors. Springer-Verlag. Finzi AC, DJP Moore, EH DeLucia, J Lichter, KS Hofmockel, RB Jackson, H-S Kim, R Matamala, HR McCarthy, R Oren, JS Pippen, and WH Schlesinger. 2006. Progressive nitrogen limitation of ecosystem processes under elevated CO2 in a warm-temperate forest. Ecology 87:15-25. Pippen, Jeffrey S. 2005. Chapter 21: Duke Forest. In Birding North Carolina, a Falcon Guide. Marshall Brooks and Mark Johns editors. The Globe Pequot Press, Guilford CT.
Hibbard KA, Law BE, Reichstien M, Sulzman J, (Aubinet M, Baldocchi D, Bernhofer C, Bolstad C, Bosc A, Campbell JL, Cheng Y, Yuste JC, Curtis P, Davidson EA, Epron D, Granier A, Grünwald T, Hollinger D, Janssens I, Longdoz B, Loustau D, Martin J, Monson R, Oechel W, Pippen J, Ryel R, Savage K, Schlesinger B, Scott-Denton L, Subke JA, Tang J, Tenhunen J, Turcu V, Vogel C) (2005), An Analysis of Soil Respiration Across Northern Hemisphere Temperate Ecosystems. Biogeochemistry 73: 29-70. Suwa, Makoto, Katul, Gabriel G., Oren, Ram; Andrews, Jeff; Pippen, Jeff; Mace, Anthony; and William. H. Schlesinger. 2004. 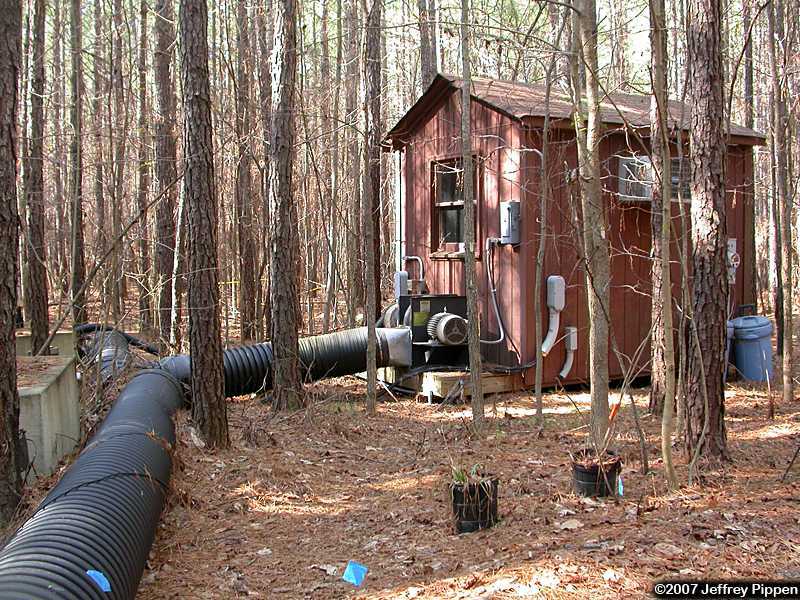 Impact of Elevated Atmospheric CO2 on Forest Floor Respiration in a Temperate Pine Forest. Global Biogeochemical Cycles 18(2) GB2013.10.1029/2003GB002182. Hamilton, J.G., A.R. Zangerl, M.R. Berenbaum, J. Pippen, M. Aldea, and E.H. DeLucia. 2004. Insect herbivory in an intact forest understory under experimental CO2 enrichment. Oecologia 138:566-573. LeGrand, H. E. and J. S. Pippen. 2003. First Record of the Western Flycatcher Complex in North Carolina. The Chat. 67(3): 96-100. Pippen, J. S. 1999. Butterflies of the Texas Rio Grande. In: A Birder's Guide to the Rio Grande Valley. Lockwood, M., McKinney, B., Paton, J., and Zimmer, B. American Birding Association, Inc., Colorado Springs, CO.
Chase, M. W., and J. S. Pippen. 1990. Seed morphology and phylogeny in subtribe Catasetinae (Orchidaceae). Lindleyana. 5(2):126-133. Chase, M. W., and J. S. Pippen. 1988. Seed morphology in the Oncidiinae and related subtribes (Orchidaceae). Systematic Botany. 13(3):313-323. Pippen, J. S., and M. W. Chase. 1988. Seed morphology in the orchid subtribes Catasetinae and Stanhopeinae. American Journal of Botany. 75(6)part 2:200. Pippen, R. W. and J. S. Pippen. 1986. A Review of Edward G. Voss' Michigan Flora Part II. Systematic Botany. 11(4):609-610.